Bob Knight reflects on his career and growing up in Ohio. 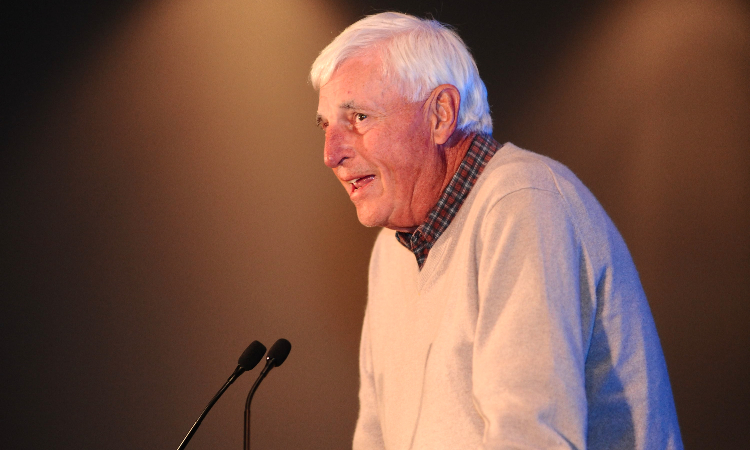 Charter Inductee Bob Knight was the 2015 Recipient of the Ohio Heritage Award. He was honored at the 10th Anniversary Ceremony on May 2 at the Greater Columbus Convention Center. A native of Massillon who grew up in Orrville, Bob Knight was head coach at the U.S. Military Academy for six years, at Indiana University for 29 years and at Texas Tech for seven years before retiring in 2008. One of his players at Army was Mike Krzyzewski, who has won five national championships as head coach at Duke University. Knight’s Indiana teams reached the Final Four five times and won national championships in 1976, 1981 and 1987. His 1975-76 squad had a 32-0 record. The Hoosiers won 11 Big Ten regular season titles. In 1979 Knight guided the United States Pan American team to a gold medal in Puerto Rico. In 1984 he led the U.S. National team to a gold medal in the Olympic Games. Knight’s coaching record over 42 years was 902-371. At the time of his retirement he was the winningest coach in basketball. Since then, Krzyzewski and Jim Boeheim of Syracuse have passed him. Bob was enshrined in the Naismith Memorial Hall of Fame in 1991.